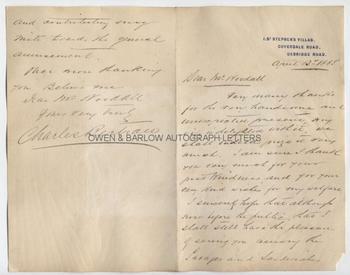 CHARLES BERTRAM Autograph Letter Signed. British (English) stage magician and conjuror. ALS. 2pp. 1 St. Stephen's Villas, Coverdale Road, Uxbridge Road. April 13th 1885. To [William] Woodall. Together with a fine contemporary photograph portrait. "Very many thanks for the very handsome and unexpected present. My wife is delighted with it. We shall indeed prize it very much. I am sure I thank you very much for your past kindness, and for your very kind wishes for my welfare. I sincerely hope that although now before the public, that I shall still have the pleasure of seeing you among the Savages and sandwiches and contributing my mite towards the general amusement. Once more thanking you, Believe me Dear Mr. Woodall, Yours very truly, Charles Bertram." 8vo. Approx 8 x 5 inches. Written on first and last sides of a folded sheet, so ideal for framing with the whole of the text visible. Small chip to bottom right corner of first leaf. Mounting residue to blank versos. 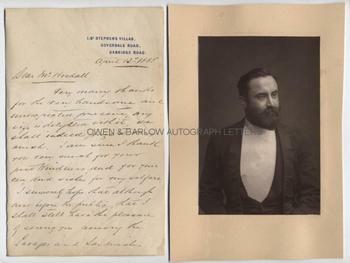 The photograph is a fine 19th century silver print contemporary with the letter. It measures approx 5.75 x 4 inches (excluding mount) and is laid down on card from an album leaf. It shows a bearded Charles Bertram half-length in evening dress. There is mounting damage and part of another photograph on verso but the photograph is in fine condition. 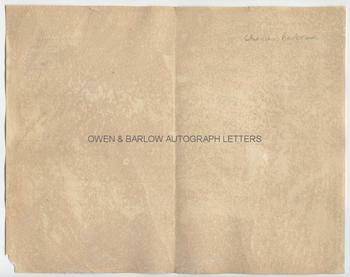 A scarce autograph and a nice associated photograph. 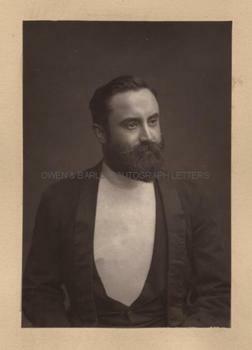 Charles Bertram, known as 'The Court Conjuror' was the quintessential society entertainer of the late Victorian and Edwardian eras. He was a favourite of the Prince of Wales (the future Edward VII) and appeared at a great number of Royal parties and fashionable society soirees. He was a supremely talented magician and was renowned for his dexterity and sleight-of-hand tricks, of which he was, perhaps, the greatest of the early practitioners in this art. His reference to "Savages and sandwiches" is undoubtedly referring to the Savage Club, of which the addressee, William Woodall, was a member.